We welcome you home: our house will be at your disposal. 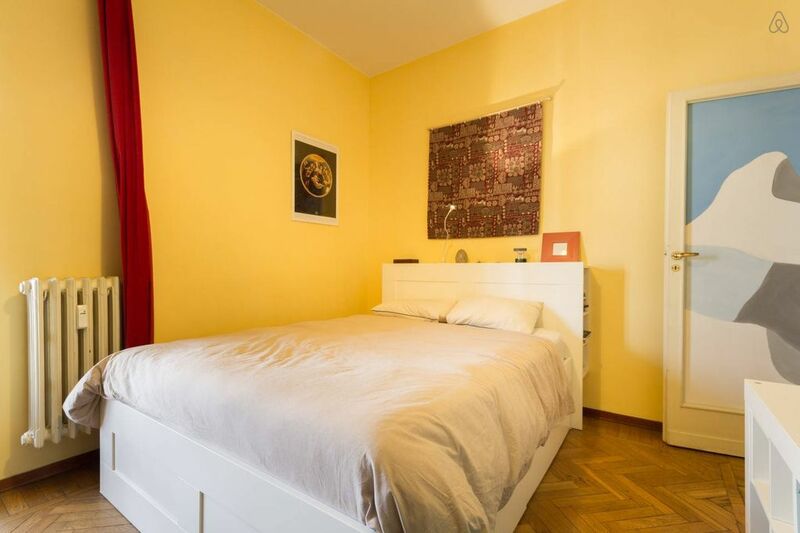 It is a spacious, family-friendly or group-friendly house, convenient for the city center, going to a concert at the Olympic Stadium, an event at Pala Alpitour, Lingotto Fiere or Palasport Tazzoli. The house is on three sides, with views of the Alps and is very bright. We can accommodate 8 people, with 2 bathrooms, with possibility of adding children's beds You will find all the services required at home: dishes, crockery, sheets and linens, oven, microwave, washing machine, wii and wifi. The neighborhood is very active, with all the shops at a short distance, and the market at the bottom of the house, with two organic market gardeners. Good family appartment on the 6th floor equipped with all facilities a normal house offers. Good beds and shower. Nice spacious living and kitchen with everything there. Balcony on the front side providing overview on the street. Besides the stairs there is a small elevator to get to fhe 6th floor btw. Owner very helpful and flexible, good English and native French / Italian speaking. Willng to help out questions travellers might have and acting quickly on requests. Parking can be done in the streets nearby, on wed / thu there is a market so take care to avoid fines. Public transport in walking distance. Not many restaurants / shops in the area. Unfortunately it was very hot during our stay (around 40°c) which made a city visit less comfortable but that had nothing to do with the fine residence we stayed in. Recommended! It was great to have rick and his family, very nice and friendly. I hope to host them again! Bell’appartamento, per chi ha necessità di muoversi con libertà in casa, offre ampi spazi e locali accoglienti. Ottimamente attrezzato, anche la cucina. Lo consiglio per famiglie numerose o gruppi di amici. Il proprietario è disponibilissimo e risponde con solerzia ad ogni richiesta. Très bon accueil de notre hôte qui a pris le temps de nous donner des bons conseils pour notre petit passage à Turin ! Nous remercions Julien pour sa confiance, sa disponibilité. Appart très sympa, excellent accueil !!! Appartement confortable, idéalement situé pour découvrir Turin et le Piémont. Excellent accueil par Julien, de très bon conseil (visites, glaces, vins locaux). Nei pressi dell'appartamento si trovano: edicole, bar, bancomat, panifici, fermata del bus e del tram e nella piazza antistante c'è un mercato giornaliero. L'appartamento sembra abitato infatti all'interno ci sono vestiti ed effetti personali del proprietario (quest'ultimo mai visto in 4 gg), purtroppo c'è un solo bagno, la cucina piccola e caotica, tv piccolissima nella stanza con divano letto e la pulizia generale dell'abitazione lascia a desiderare( le lenzuola del divano letto erano piene di peli di animali). Fortunatamente abbiamo usato l'abitazione solo per dormire altrimenti sarebbe stata invivibile. A dimenticavo, noi eravamo in 8 e nella stanza dei bambini c'era un letto a castello e due materassi buttati a terra (roba da extracomunitari). Tutto quanto fornito dalla casa è descritto: bisogna leggere la descrizione. Noi diamo il massimo per fare stare la gente bene a casa nostra: Giuseppe ci aveva chiesto di avere per i suoi bambini due materassini ed è ciò che abbiamo fornito. Bisogna ricordare che è una casa vera, da privati, e non un albergo. Giuseppe non lo sapeva però prenota su Abritel, senza leggere la descrizione. Inoltre non abbiamo animali e quindi non è possibile che ci siano peli di animali in casa.